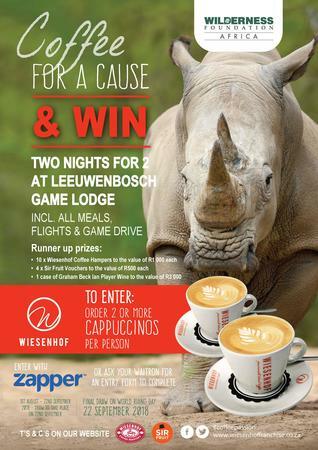 Wiesenhof supports Wilderness Foundation Africa whereby 60c for every cappuccino sold is donated to the Foundation. Wiesenhof Coffee Holdings group oversees both the Wiesenhof brand and Roastery, but also the sister brand Dulce Cafe." This initiative has been taken a step further with a competition being launched by Wiesenhof Coffee Holdings at their 65 Wiesenhof and Dulce franchises throughout South Africa for the months of August and September. For every 2nd cappuccino purchased per person, customers will be entered into a draw to win a 2 night stay for 2 people at Leeuwenbosch Country House, on the Amakhala Game Reserve in the Eastern Cape. The prize includes flights, meals and game drives on this private game reserve. Check out the Wiesenhof menu for more information on Wilderness Foundation Africa.